Corn is still around. Maybe it's dried and you're picking it off the cob to have popcorn like some people I know, or maybe you still want to buy it and boil it or throw it on the grill. Hold on to summer. It's cheaper now maybe, and surely you're going to miss it when it's really out of season. Well, why not warm up with some soup. This soup, like many others you've "seen" me make is rather simple. 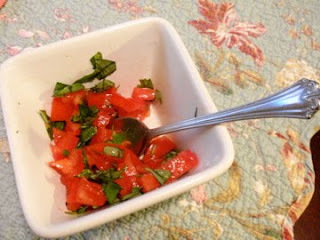 The tomatoes and basil on top really make this, so be sure to add them. 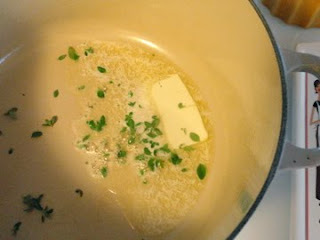 Melt butter in a stockpot over medium-high heat. 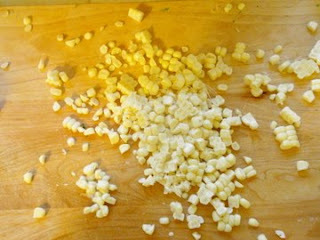 Add onions, thyme, 1 teaspoon salt, and 1/2 teaspoon pepper, and cook until onions are translucent, about 5 minutes. Stir in corn and 4 cups water. Bring to a boil. Reduce heat, and simmer, covered, for 5 minutes. Use your immersion blender to blend this to your liking. Thin with up to 1 cup water if desired. Reheat soup before serving. Toss together tomatoes, basil, and oil. Season with salt and pepper. 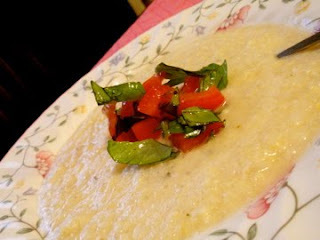 Garnish soup with tomato mixture, and drizzle with oil.